It doesn’t matter whether you are a professional chef or just learning how to cook, if you need to go to your kitchen you must need a food processor in your kitchen. Depending on your needs, you would need either a mini food processor; or a small one; or even a large 14-cup if you have that big family. But remember that whatever the size is, you have to keep some key points in your mind to count on while buying one for yourself. There are a number of things you should consider while buying the best food processor for your needs and is the complete food processor buying guide for you. Below are some key features to consider before buying your best food chopper. First, if you are going to pay for such a vital kitchen gadget, better pay wisely. Focus on the key features according to your needs while buying a food processor. Speeds – There are two-speed settings in a food processor usually: ON/OFF and PULSE while most of the time food choppers have one or two pulse setting controlling the power to high and low. Multifunction Accessories – Most of the food processors come with multifunctional accessories such as shredding and slicing disks, juicer attachments, and interchangeable blades to do a variety of jobs. Pick it as your need demands. Dough Blade – Dough Blade is a blunt blade helps to knead the dough. You should look for it if you need this function very often. Liquid Max Line – This is the indicator for the maximum liquid surface. In other words, you can check the acceptable liters for your food processor. Avoid crossing the food processor max liquid line. These are the key features that you must consider to make a good decision. However, your curious mind might still search for some more information. I hope this following section will make it all clear in your head. Comes with shredding and slicing discs. Little tricky to adjust the discs. Cuisinart has now become one of the best reliable brands for a food processor. Besides food processors, Cuisinart have introduced a variety of specialty products such as wine cellars, bread makers, popcorn makers, a juice extractor, deep fryer and pressure cooker. 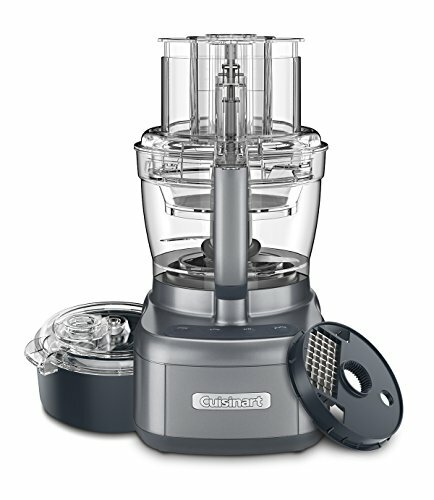 Amongst all products, Cuisinart has earned a very good reputation for their food processor as they introduced some unique designed and well-functioned food processor which took over the food processor market. Cuisinart’s “Custom 14” food processor model DFP-14BCNY, for example, has become very popular in the present market. 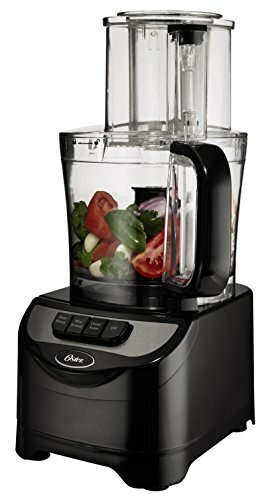 This food processor excelled at almost all types of jobs like chopping onions or slicing tomatoes. This processor works well as much as a razor-sharp chef knife does and kneads the pizza dough just like a smooth elastic ball. The only cons of this great food processor included shredding mozzarella. But this is a common shortcoming that we have found in most of the food processor. They actually fail to produce shreds evenly. 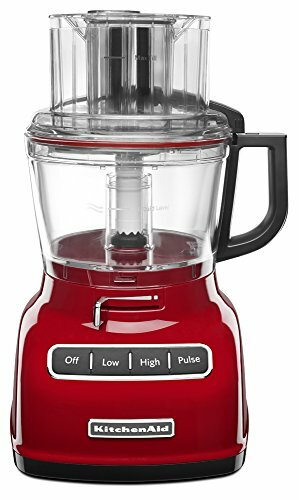 This DFP-14BCNY is not a small food processor but this 16 inch tall Cuisinart chopper will perfectly fit under a cabinet and it is not too heavy as well. Its operation is quite simple: this processor has two large levers to press, the first one helps to run the processor continuously and shut it off and the second one is used for the pulse. In addition to the basic mixing/chopping/dough blade, this model comes with a shredding disc and a slicing disc. To use these discs, you need to attach them to a stem which sits in the bowl. While doing this be aware that it is a little tricky to click these discs into place. The food hopper locks into place at the rear of the bowl, which is a bit uncomfortable when feeding in food but makes it easy to see what happens in the cup during treatment. Since the tube is large, it is not necessary to cut a block of mozzarella cheese or tomato in half before treatment. During its operation, the Cuisinart is so quiet that it does not impede conversation in the kitchen. Cleaning is very simple because Cuisinart is the only manufacturer that encourages you to wash the parts in the dishwasher. They are available in white or black with touches of stainless steel or polished stainless steel. You can purchase a disk storage unit, flat cover, shredder and other cutting discs and accessories that vibrate separately. Besides this model Cuisinart has launched many more popular food processors such as Cuisinart Custom 14 cup food processor and 11 cup Cuisinart Prep 11 Plus. Cuisinart is undoubtedly one of the best food processor brands in the word. 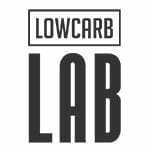 They have been leading the market with a consistent and good reputation and you can rely on this brand for quality products for your kitchen. Various size and types of food processors. Some food processors by Kitchenaid seems a bit pricey. KitchenAid is the renowned brand name for any kitchen appliances. And no matter what is your career background, you must have been introduced with this name once in your lifetime. KitchenAid has successfully retained their name in the top 5 list of best kitchen appliances brands. Their major kitchen appliances include the Cooktops, Refrigerators, Ranges, Dishwashers, Wall Ovens, Water filters and etc. Besides, their countertop appliances include Stand Mixers, Hand Mixers, Hand Blenders, Blenders, Food Processors, Coffee Makers, Countertop Ovens, Toasters, Microwaves and etc. KitchenAid has a long list for best quality kitchen appliances and thus they have sold a variety of top quality food processors and still with the popularity they have retained the market in the USA as well as all over the world. KitchenAid introduced a variety of food choppers at different size and budget. KitchenAid 3.5 cup mini food processor is one of the best sellers in the market. This mini food chopper is budget friendly and also capable of doing quite a number of tasks. This mini appliance will chop vegetables more evenly than many other mini food choppers. Thus, if you are willing to make small batches of mayonnaise or similar items like that then we would definitely recommend you not to switch for any other than this KitchenAid 3.5 Cup Mini Food Processor. This appliance is very easy to operate. This mini food processor comes with a handled jar with push-button activation which makes it way too much convenient for you to operate. Though you cannot shred ingredients or knead bread dough with this mini processor yet this mini processor is quite an item that worth the money. In our review, you probably cannot get better service at such a little investment with any other mini food processor. Nevertheless, if you have been in search of a larger sized food processor then KitchenAid didn’t forget about you as well. The KitchenAid 14 cup food processor might be the one you are searching for. This food chopper is excellent at chopping and shredding vegetables, grinding parmesan cheese and kneading bread dough. You can also mince parsley, shred mozzarella and slice the tomatoes as good as any other best food processors. It is easy to assemble and o. Its multiple power settings and pulse feature will ease the operating. But this one can be a little pricey for some people who have been looking for a medium budget food processor. For those, you can look for the other KitchenAid food processor as they offer a variety of products for your need. Suits well with all kitchen. 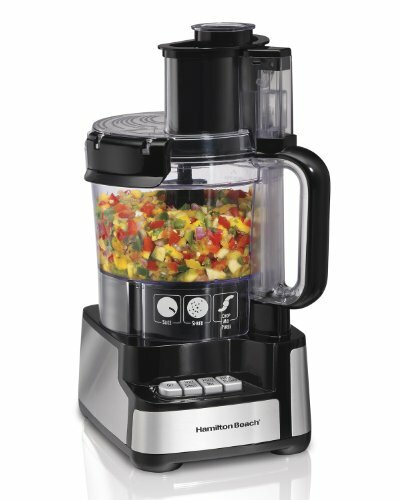 The 3rd brand name in our best food processor list is the Hamilton Beach. 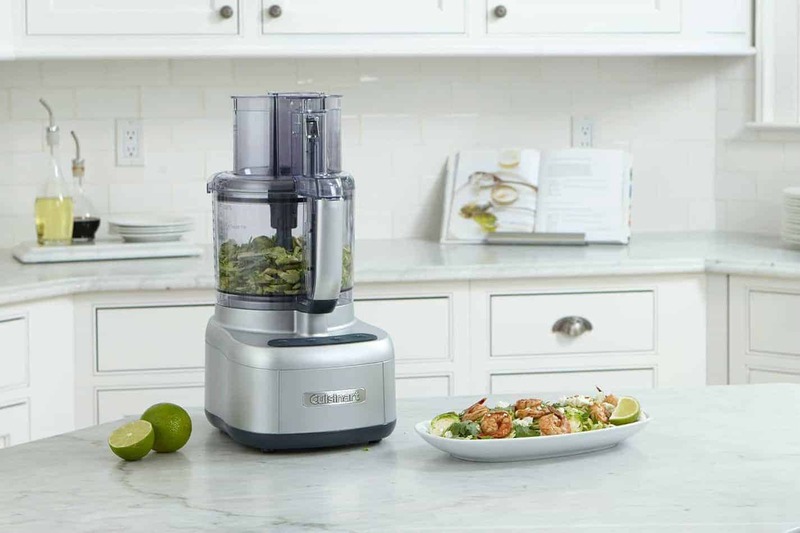 Hamilton Beach launched quite a big number of food processor models in the market and most of them come with some specialty for various customers. The Hamilton Beach Bowl Scraper (70730) is such a different processor. This Hamilton processor is a great one as this one has been designed to scrape down its sides. So, with this medium-sized food processor, you won’t need to stop and remove the lid to manually move the foods into its center. This Hamilton food processor features a built-in scraper which helps to move the food when it is on or off to its speed up food preparation times. This processor has a large feed chute which ensures there is less chopping up of the foods before going in. Hamilton Beach Bowl Scraper has a capacity of 10 cups of food which indicates that this is not that large yet not that small. It is a perfect medium sized food processor and ideal for any family. This model does a great job with slicing, shredding, chopping, mixing, pureeing and blending. The best part of this model is that it will easily fit into any small or large kitchen. So, you won’t have to worry much about the settings. It will look good anywhere. This Hamilton 10 cup food processor probably is the best choice within its price range but you should not be expecting the best quality. Another issue you must count upon before buying this model is that this processor is light to carry, so it will not feel very sturdy. So, it can be a little noisy comparing to the other processors. Works well for chopping, grinding, making dough and etc. Oster brings some good news for the customer who is looking for the best food processor at the best price. Oster launched the Oster Total Prep 10 Cup Food Processor at just $60 which is very reasonable for most people who are looking for the best appliance for the basic food processing. The Oster Total Prep is one of the easiest to operate food processors we have evaluated. This model comes with an S-shaped blade specially designed for chopping; a reversible shredding disc; a dough blade and a reversible slicing disc. It has a lid and feed tube which are both very easy to assemble. It will give you a quick cleanup as all the parts and accessories of this can be washed in your dishwasher. This 10 cup processor allows you to process evenly diced onions as well as shredded carrots, but the task of mincing parsley can really upset you as it bruise parsley a bit. This model does a great job at your kitchen but producing comparatively more waste can be a shortcoming of this product as well. The Oster 14 Cup Food Processor can be another Oster product that you can consider to buy for your kitchen. This Oster processor has two bowls with different capacity; one has 14 cup foods capacity while the other has 5 cup foods capacity. The large feed mouth sets it apart and features the continuous feeding feature which is capable of cutting down whole fruits like apples and vegetables like potatoes. It is necessary to mention the blade’s motion as it is reversible. So you have to be a little bit careful when operating with this chopper. This food processor model is a perfect one for a big family but it comes at a higher pocket pinch. Induction motor helps to reduce the noise. Our last but not the least review in our best food processor brands list is Breville. Breville is basically an Australian company with 80 years of experience and a good reputation for the best quality kitchen appliances. One of the many best appliances by Breville, we have listed their BFP600SIL and the BFP800XL food processor as the best two Breville food processors. Breville realizes that not all foods come in the exact same size or packaging. Thus, they have launched the BFP800XL food processor with much versatility being able to accommodate and really work well with a variety of foods for our everyday life. 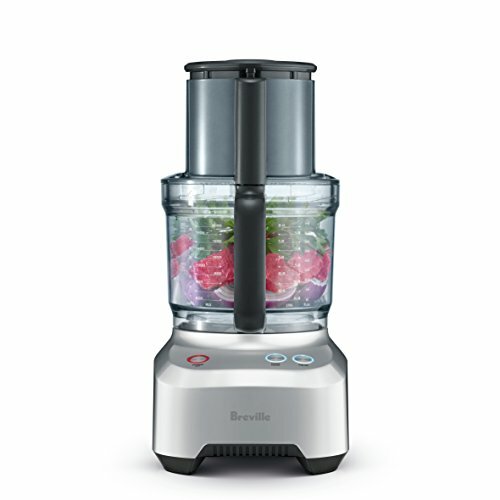 Breville BFP800XL is a very popular food processor model for its quality and 1200 watt induction motor. The high power motor really makes it different and saves quite a lot of time to process the foods and the induction motor helps to make no noise. This model is a perfect one for you if you want to process extra-large batches of food quieter and quicker. Its S blade will ease you for doing many tasks within a very short time. The Breville BFP660SIL is a bit smaller than the BFP800XL. At a capacity of 12 cup, it is a very good choice for smaller families while the 16 cup capacity will be great for both families as well as entertaining. The Breville 12 cup food processor has no mini bowl with it, which sets the 16 cup food processor ahead of it if you want to use it frequently. There is a 1000 watt induction motor equipped with the Breville BFP660SIL whereas the Breville BFP800XL’s is equipped with 1200 watt induction motor. With the BFP660SIL the processed food will be even and consistent. This is because BFP660SIL comes with an additional momentary pulse button that utilizes more of that power and control. The major difference is the feed chute. The feed chute in the 12 cup is just 5-inch whereas in the 16 cup, you can get a 5.5-inch feed chute. So it is clear that Breville BFP800XL will save you both time and energy. A food processor is a multipurpose kitchen appliance which saves a lot of time and can easily chop, slice, grind, shred, and puree for almost any food. Some food processor models can also assist with the home cook in making citrus or vegetable juice, kneading bread dough, beating cake batter or egg whites, and grinding meats and vegetables. Food processors are ideal for more labor-intensive tasks in the kitchen, such as making dough for bread or pizza base. Food processors usually have wide mixing bowls — which make it easy to add in ingredients — and typically come with various attachments and allow you to do a variety of works like slicing carrots, shredding cheese, or mixing the dough. If you’ve ever bought or looked for a food processor, you’ve probably noticed a long list of the processor features listed on the package, usually includes chopping, slicing, mixing, shredding and pureeing. While on the other hand, blenders have become more capable over the years, but they still can’t do much more than blend. A powerful blender, for instance, can crush ice, and some top quality blenders are capable of making everything from ice cream to peanut butter, but a typical and affordable blender isn’t going to be able to handle that number of tasks as much as a food processor can. Blenders are typically built with features that make them ideal for preparing smoothies. While some blenders have easy-to-pour reservoirs, whereas some other models are made in a manner so you can drink out of the same blender cylinder you used. The present market will confuse you a lot of time to choose the right and the best products as well as brands. Here we have made a little try to make it easier to make the right choice according to your needs. We have listed all 5 brands with various food processors with a variety in quality, size and price range. Our attempt means to help you to choose the right quality and sized food processor at your best price.